There was a time, long before the days of blockbuster sci-fi movies, when anyone professing an interest in science fiction – or who had even heard of the genre – was likely to be a science geek. These days it’s different. Everyone has heard of science fiction, and even people who automatically think ‘all science is boring’ may count themselves as sci-fi fans. This translates into a huge opportunity for science communicators. After all, how can a science book be boring if it uses ideas from science fiction as a springboard? Brian Clegg has already used this approach on two of science fiction’s best known themes: time travel (How to Build a Time Machine) and interstellar travel (Final Frontier). In his latest book he applies the same logic to a whole range of other sci-fi tropes, from robots and ray guns to clones and cloaking devices. If the book has a recurring message, it’s that real-world technology is less impressive than its sci-fi counterpart. Present-day quantum teleportation may do pretty much the same thing as a Star Trek transporter, but it does it on approximately 1028 (ten thousand trillion trillion) fewer atoms. Modern computers may have voice synthesisers that sound as good as HAL 9000 in 2001: A Space Odyssey, but they don’t have anything like Hal’s deductive or conversational powers. The security hologram on your credit card is, all things considered, not in the same league as the holodeck in Star Trek: The Next Generation. Of course, there’s no reason why sci-fi technology should be a feasible proposition in the real world, either now or at any time in the future. 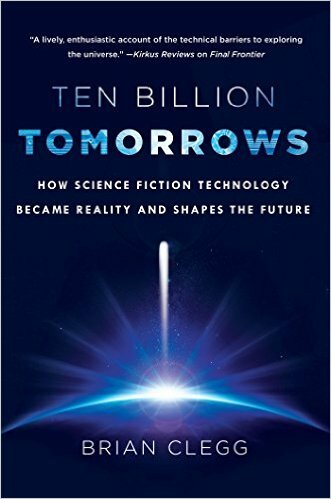 As Brian Clegg points out in the book’s first chapter: ‘Science fiction does not set out to predict the future – instead it’s about asking “What if?” for all kinds of scenarios. It doesn’t matter if those possible futures are likely to happen or not, as long as they are interesting.’ In light of this, the surprising thing is not that real-world counterparts fall short of sci-fi expectations, but that real-world counterparts exist at all. Ten Billion Tomorrows is essentially a book about science, not science fiction, and the author doesn’t let himself get bogged down in sci-fi geekiness. Most of the chapters are focused on a well-known sci-fi concept – something that is so familiar, even to the casual movie-goer or TV viewer, that it barely needs to be described before plunging into the – usually much less familiar – scientific reality behind it. A notable exception is Chapter 13, which deals with trips to the Moon. In this case it’s the reality – Project Apollo – that is so familiar it hardly needs to be described, while the preceding centuries of fictional lunar voyages are almost forgotten. Yet these make interesting reading, if only because they never quite managed to get it right – even in the 1950s, when all the scientific groundwork for Apollo was already in place. As the title suggests, the potential scope of this book is enormous. It’s inevitable, therefore, that some readers are going to spot omissions they feel really should have been included (a point the author acknowledges right at the start). At the same time, the book covers so much ground that everyone will find something new in it, no matter how much of a sci-fi fan or science geek they are. Brian Clegg’s books are always enjoyable and informative to read, but this one has the added attraction that it flits so quickly from one subject to another that you never quite know what’s coming next. If there’s such a thing as an ‘edge of the seat’ popular science book, this is it!